Daniel has been a Coletta Collections worker since 2012. Right from the beginning, Daniel surprised all of us with his focus and eye for detail. When we have a project that requires perfectionism or jewelry with teeny tiny details Daniel is the guy. He prides himself on being the one of our only workers that will take on any task, even those that often frustrate or confound his staff. He is also a self-proclaimed artist, and enjoys learning and working on art in many different mediums. Our products provide him with a great outlet for all of his creative energy. Daniel’s love of details lends itself beautifully to working with dye. Dyeing fabrics can be very fickle. It requires a person to be exact in timing, measuring and consistent from scarf to scarf. While working on dye projects Daniel takes part in many of the steps, but this season he volunteered himself to be the timekeeper and stamper. Daniel is not one to get distracted and was excellent at giving warnings when it was close to the end. Our Peony Printed Scarf (shown to the left) was his favorite project of the season, here he stamps our flower pattern onto the scarf he dyed earlier in the day. He also worked with the team to dye the base colors for the Matis Printed Scarf as well as the Petunia Tie Dye Scarf. Daniel just turned 30 and working at Coletta Collections provides him with meaningful and creative work. 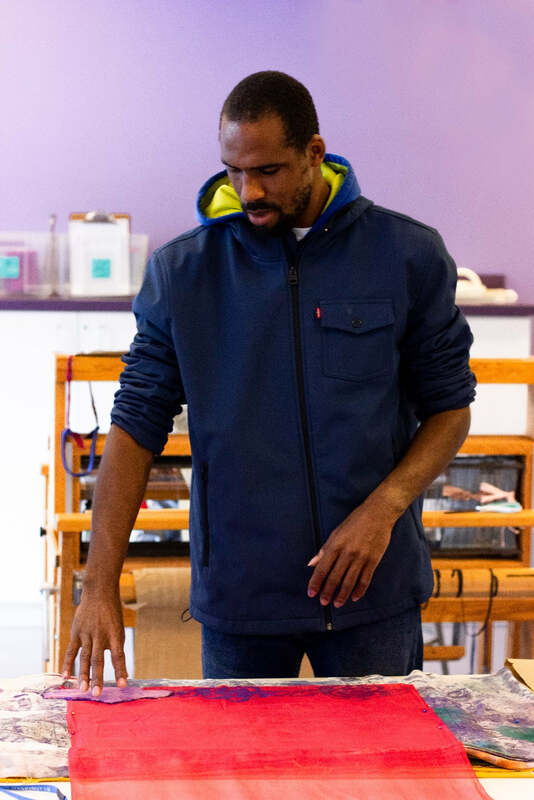 We regularly work with Daniel to create new prototypes as his love for art enables him to come up with creative patterns and color combinations. Daniel occasionally struggles with following a pattern rather than making one of a kind creations but each day we are excited to continue to see possibilities beyond disabilities. Shop one of our beautiful products to help support Daniel and workers like him. Celeste has been a Coletta Collections weaver since September of 2017. During this time we have seen a tremendous amount of growth in her skills. At first Celeste was only interested in the beautiful colors, and would sit in front of the looms enjoying all the bright yarns. She didn’t seem overly interested in weaving, but would happily sit next to those who were working and let you know when she thought something was “so pretty”. With some encouragement, Celeste began to weave. Her first project, where she learned all the technical skills of weaving was, a simple teal and white warp. It was a bright color, and we quickly learned that Celeste would weave a project if the colors we bold and the pattern was pretty. Her first project that we sold was the blue fabric for our Rabat Messenger Bag. Celeste is a powerful weaver and can make a very tight, close weave. Her style of weaving is perfect for bags and totes both of which require a strong construction that holds up to wear and tear. Since then she has also woven all of the fabric for our Umea Crossbody Bag (shown in the picture on the left) and the nearly 25 yards of fabric required for our Bubba Baby Wrap. Celeste is now 53 years old and working at Coletta Collections provides her with meaningful work in a supportive environment. On a daily basis we work on the skills needed to be successful in the workplace. She continues to work on identifying and independently fixing mistakes and advocating for assistance when needed. 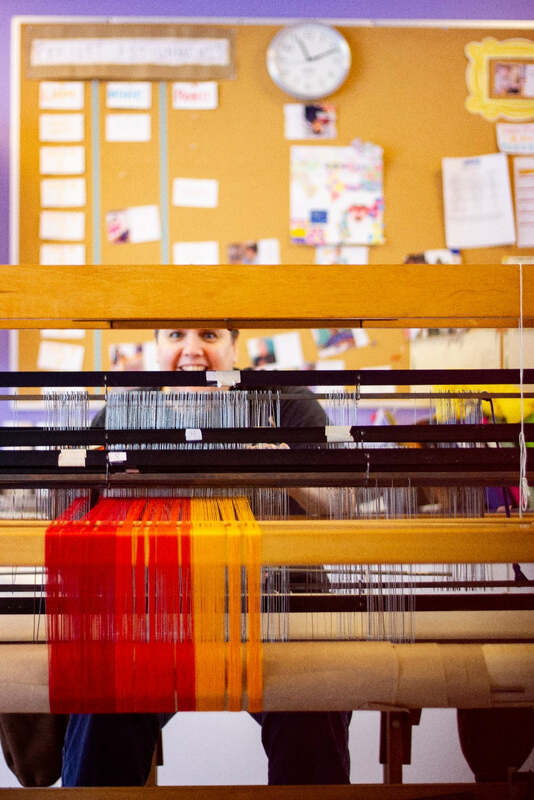 Celeste has become one of our prominent weavers, and each day we are excited to continue to see possibilities beyond disabilities. Shop one of our beautiful products to help support Celeste and workers like her. Janet has been a Coletta Collections worker since 2016. Janet loves jewelry and especially loves anything that comes in jewel tones. In her life outside of program Janet enjoys shopping for purses and new pieces of jewelry as well as anything that sparkles. Janet would walk by the studio windows at program and stare longingly into the room, eyeing all of the beautiful colors of glass and gorgeous pieces of jewelry. Janet struggles with working in loud environments or with others who like to talk. She is a quiet and focused person and requires a working environment that is similar. So on a peaceful day at program we invited her into the studio and showed her how to work with the pieces of glass. 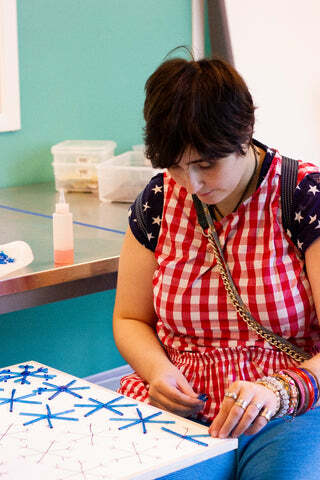 She immediately fell in the love with the shades of blue we use for our Snowflakes Ornament and so she happily sat down and worked for three straight hours. It turned out that Janet can follow a pattern –no matter how detailed- better than anyone else we know. She has now worked on our snowflakes ornament for two years in a row and last spring worked on a beautiful piece for our annual Gala. One of the most incredible aspects is that she can make these beautiful pieces with absolutely no assistance from staff. All we have to do is show her the pattern or an example of the final piece and she can replicate it perfectly. Janet is 25 and faces a difficult battle when it comes to finding employment. Coletta Collections offers her a safe and quiet space for her to build her skills. We hope that as time passes Janet can adapt to her environment a little more but in the meantime, we continue to see possibilities beyond disabilities. Shop one of our beautiful products to help support Janet and workers like her.